Nick Young of the Los Angeles Lakers celebrates during Friday's 104-91 win over the Minnesota Timberwolves at Staples Center. No Kobe, no problem. The Lakers have a mini-Mamba backup plan in Nick Young. With Bryant out for the second time this season, who better to fill his shoes than Young, the SoCal native who grew up watching him become a Lakers legend. Young, now 28, has sparked Sixth Man of the Year talk with his play in his first season with the Lakers. A stone-cold shooter like Bryant, Young’s averaging a team-high 15.3 points off the bench, shooting 44.5 percent from the field, 39.6 percent on 3’s and 79.8 percent at the line. On Friday night against Minnesota, with all eyes on the Lakers’ depleted backcourt — besides Bryant, they’re also missing all three of their point guards with injuries — Young alleviated the stress the way a healthy Kobe would: He shot his way out of trouble. Young scored 25 points on 9-of-14 shooting, nailing 4 of 6 3’s and completing a four-point play to help LA overcome 19 turnovers, including five of his own. His final 3, with 2 minutes left, was the dagger in the 104-91 win. More than scoring, Young has given this ragtag group of Lakers something that Kobe usually provides: swagger. After Pau Gasol hit a 3 to beat the shot clock, he even celebrated with Young in "Swaggy P" style. Coach Mike D’Antoni was feeling it, too, after the game. D'Antoni on Nick Young: "He rubs off on me. He makes me happy. He starts … swagging … or something … and it gets me going." Ever heard a coach talk about Kobe like that? And Young’s swag doesn’t stop when the game ends. Even Kobe has taken notice. "Nick obviously is an incredible creator off the dribble so we gave him space to operate and he did a fantastic job," Bryant said this week after Young scored 18 in a win at Memphis. Young admits he thought the same thing as everyone else: When Kobe came back, Nick’s scoring would go down. "All of us kind of thought that a little bit," Young said this week. "Kobe is one of the best players to play this game and he’s coming back and he demands the ball." But Young’s scoring actually went up with Kobe on the court, and he even looked a little bit like Bryant on the defensive end. "That’s what I’ve been working on. Been talking to Coach about it, Kobe’s been helping me out with it," Young said. "Just learning, getting older, finding out how to do everything out there on the court." 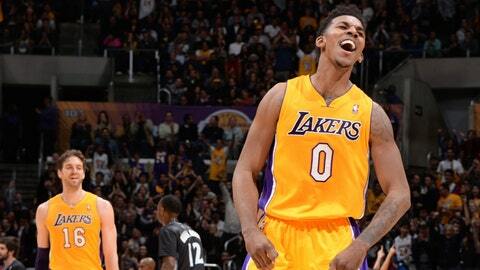 Now with Kobe out again, the Lakers need Swaggy P to be all he can be — and Bryant knows it. "He’s been on my back," Young said. With all the questions about Bryant’s health, Young is fast finding out just how big he can be — even in Kobe’s shadow.